The Truth About Lyme Disease: Sniff out the myths and get the facts to protect your pet. Lyme disease? What’s the big deal? Did you know that Loudoun County has one of the highest rates of Lyme infection in the United States and the highest prevalence in the state of Virginia? Lyme disease is transmitted by the deer tick. Ticks are common parasites that can be found anywhere- from heavily wooded areas, to urban parks, and even steps from your house in your own backyard! Ticks on dogs usually occur when your pets have fun in long grass or wooded areas; these ticks like to hang around these areas waiting for a host to feed on. In most cases, they’ll hitch a ride on your dog’s fur as he’s walking, running, or playing. Once attached, they remain on their host for hours or days depending on when they finish eating. The image below shows the two year life cycle of ticks from egg to adult. The adult female ticks lays her eggs (she can lay up to 3,000 eggs at one time!) in a sheltered environment such as low vegetation in the spring. When the larvae hatch (usually in early August) they remain in the vegetation until they can attach to a host. At this stage (#2), the host is usually a bird or small mammal such as mice or chipmunks. During the larva stage, ticks are most likely to pick up Lyme disease bacteria from an infected host. After feeding on their host, the larvae become dormant until the next spring. They drop to the ground and molt into an 8-legged nymph. During the spring months of year 2, the nymphs will find another host to attach to. Again, it could be birds or small mammals, but nymphs may also attach to pets or even us! The nymphs will gorge on their blood meal, drop to the ground, and molt again into an 8-legged adult. Just as in earlier stages, the female adult tick will look for an appropriate host that Autumn – at this stage it’s most likely large mammals like deer, dogs, or humans – to feed and get ready to lay their eggs, and begin the cycle again. Adult male ticks feed very little and occupy larger hosts, primarily for mating. 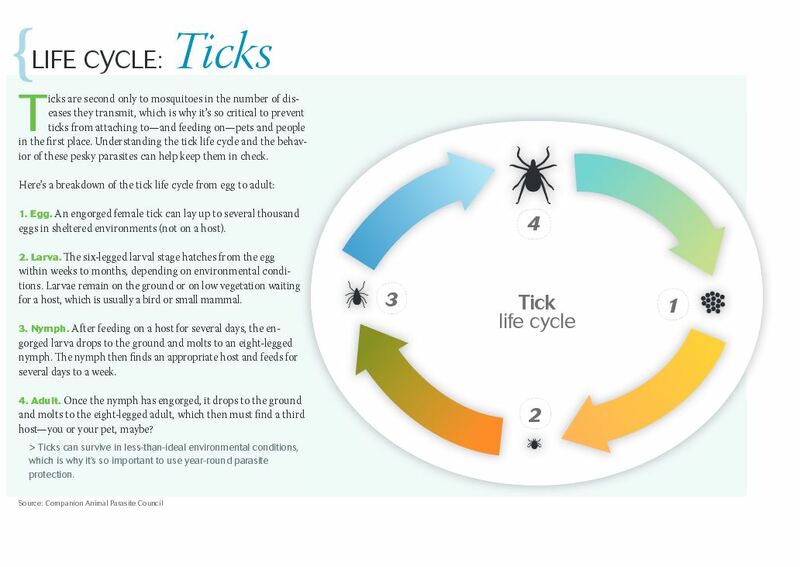 Ticks can be carriers of Lyme disease and transmit the bacteria to pets and humans during several stages of their life cycle and during various times of the year. If you don’t notice ticks on yourself or your pets, the bites may be hard to detect and symptoms may not be noticeable until months after infection. Symptoms of Lyme disease include fever, fatigue, stiff and painful joints, and loss of appetite. I’d like to check you for ticks! 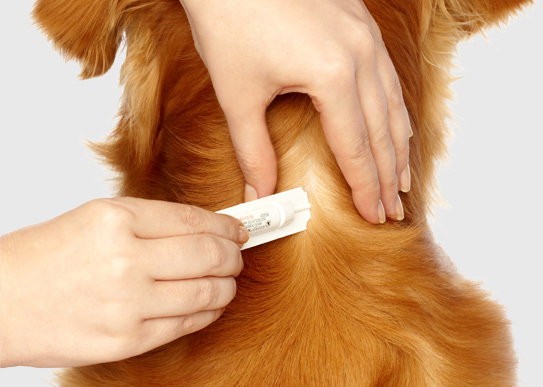 With so many ticks preventatives readily available (from both your veterinarian and over-the-counter), it can be confusing to know which ones are best for your pet. The ideal medication should be easy to give or apply, safe, effective, and readily available all year round. It is important to treat your pet during the winter months as parasites can thrive year round in the relatively mild Virginia climate. These preventative medications should be the appropriate size/dosage for your dog or cat, and specifically meant for your pet’s species (Medications labeled for dogs should never be used on cats, and vice versa). And while many topical medications are available at big-box retailers, we strongly recommend purchasing your preventatives through LVH or our online pharmacy to ensure the product is safe and coming directly from the manufacturer. A little preventative care will go a long way in helping to prevent tick infestation and Lyme disease. Leesburg Veterinary Hospital strives to practice the best medicine. A more protective Lyme vaccine (Zoetis’ crLyme vaccine) is now available to the veterinary profession and we have chosen to offer this vaccine in our preventative medicine repertoire. To receive the full protective benefits of this annual vaccine, a first time inoculation is advised, followed by a booster in 3-4 weeks. For pets who have already been vaccinated with our previous Lyme vaccine, an initial inoculation followed by the booster with the new vaccine is recommended by our doctors. Please feel free to contact us with any questions prior to your pet’s annual appointment. ← An update on Bailey – he’s ready for adoption!